The ending of Budd Schulberg‘s extraordinary life at age 95 last night was just a little strange for me personally. By a very odd coincidence, just the night before I finished watching the 1959 TV production of “What Makes Sammy Run?,” Schulberg’s great and possibly never-to-be-filmed 1941 novel about Hollywood careerist dehumanization (yes, it goes back that far, at least). The DVD included an interview he gave just last year. Given his age and fairly obvious frailty, I wondered how long it would be before I’d be writing one of these posts on him. He was not a young man, but this is still too soon. Anyhow, what can you say about the writer of “On the Waterfront” and “A Face in the Crowd” — two of the most acclaimed screenplays ever written — and the nastily on-point movie business novel which was so effective it is supposed to have driven the usually jovial John Wayne to physical violence? 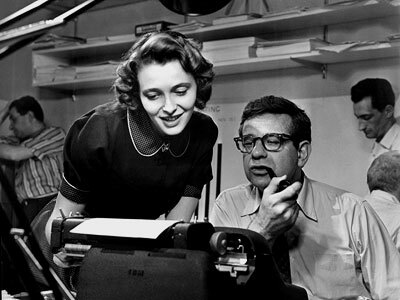 Of course, Schulberg got it from all sides, though for differing reasons. Like most liberals, I have serious complaints with how Schulberg and his more famous directing collaborator, Elia Kazan, comported themselves during the McCarthy era, and certain lines in both of their most famous films stick in my craw. While Budd Schulberg never abandoned his liberalism, it’s clear to me that his entirely justified anticommunism took a form that helped that American extreme-right, harmed the first amendment, and bolstered the most vicious aspects of U.S. foreign policy. Still, there’s no denying the power and clarity of his writing or the moral values they expressed at their best. As it happens, I posted one great scene from “A Face in the Crowd” just last week. I’m posting more after the flip, starting with a scene with Andy Griffith and Patricia Neal that should knock your socks off. Tags: A Face in the Crowd, Andy Griffith, Budd Schulberg, Elia Kazan, Joe McCarthy, John Wayne, McCarthy era, On the Waterfront, Patricia Neal, What Makes Sammy Run? Ron Howard returns to acting and teams up with a couple of his most famous former co-stars to prove just how serious he is about seeing change in the White House come Election Day.